Why choose to take a holiday in a cave? "It was our first time staying in a cave. "Wow, best night's sleep I have ever had. I want one!" If you have not yet enjoyed a holiday in a cave then this is the perfect place to start. We have just the right cave to suit you – all you have to do is choose which style of cave you prefer. Each one is slightly different and has its own character. Whichever cave you choose you will be amazed and want to return again and again as we did. A cave is a magical, peaceful place for you to unwind and gives you a holiday to remember. Interior design – the caves have a peaceful and calming atmosphere and are tastefully designed with a mixture of light, modern and Spanish interiors. There are many interesting and decorative pieces of vintage farming equipment inside each cave and around the site. The rooms are cool in the summer and warm in the winter although there is central heating available for those extra cool winter nights. P.S. 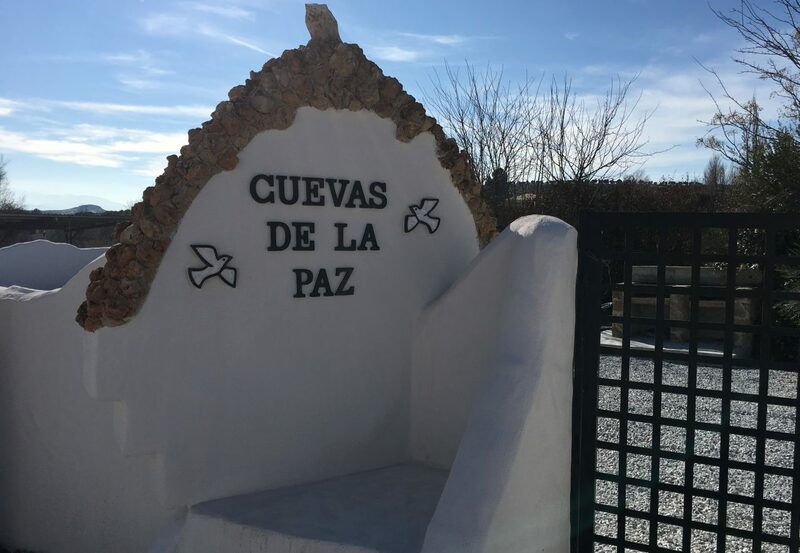 If you are looking for accommodation with a group of friends or relatives we can accommodate up to 18 people at Cuevas de la Paz. Stay together and continue enjoying your holiday or celebrations. We are looking at providing activity packages such as Yoga, healing gemstones, herbal remedies and cookery. If there is something that you would like to do please get in touch and we will see what we can arrange for you. Wifi and media – all caves have wifi throughout, flatscreen tv’s with built-in DVD’s. We have 3 Firesticks available so you can view Amazon Prime films and programmes (subject to availability). We are also happy for you to bring your own Firestick or Google Chrome etc (TV’s have USB and HDMI sockets) . Utilities – Each cave has a well equipped kitchen with 2 hobs, microwave, toaster and fridge,. The bathrooms have either a spa bath with overhead shower or a shower cubicle. There is a communal washing machine if you should need it with drying facilities in the garden area. Bedrooms – All bed linen is of good quality and mattresses are comfy ensuring that you have a great night’s sleep. We use quilts on our beds but there are blankets if you prefer. Gym – Yes a gym. If you feel that you may have eaten to many tapas this may be what you are looking for. There is a separate room to the caves that has a treadmill ( with a USB point and MPS), rowing machine, exercise bike, elliptical bike and hand weights. All we ask is that you wear gym shoes when using the equipment. Parking and location – Cuevas de la Paz are easily accessible and have ample undercover park ing. The caves are in a peaceful location with little or no passing traffic. One of the most popular restaurants in the area is a couple of minutes walk away. Emilio’s is well known by local people for good food and a great venue for that special event. The restaurant has great local dishes but if you are in need of a good English Breakfast then this is the place to go (especially for great tapas). Outdoor areas – Each cave has its own outdoor table and chairs. There are two separate BBQs giving you the opportunity to enjoy your evenings under the stars. We have also added a large communal area which has a lovely stone table, hammocks and sunbeds. Activities – Try your hand at Moroccan/Lebanese cookery and gain great tips on recipes. Take a bike ride along the river which runs alongside the lunascape unique to the area. Have a tailor made trip to a mountain village or to one of the 3 great lakes we have in the area. How about a visit to Cortijo Buho where you can fly owls as if you‘re the falconer, see the meerkats, kookaburra, peacocks and meet a host of other animals. Whatever you would like to see or do please ask as we would be happy to give you suggestions and further information.